A 91-year-old right-handed man presented to the emergency department with left-sided weakness, which started approximately five hours prior to presentation. Pertinent medical co-morbidities included atrial fibrillation and a prosthetic aortic valve, not on anticoagulation, as well as hypertension. His initial National Institute of Health Stroke Scale (NIHSS) score was 18, and his clinical presentation was consistent with a right hemispheric infarct. Symptoms included dysarthria, left lower facial droop, flaccid left arm, weak left leg, and left hemineglect. As part of the routine stroke protocol at our institution, a non-contrast CT head, CT perfusion of the brain, and CT angiography of the head and neck were obtained. 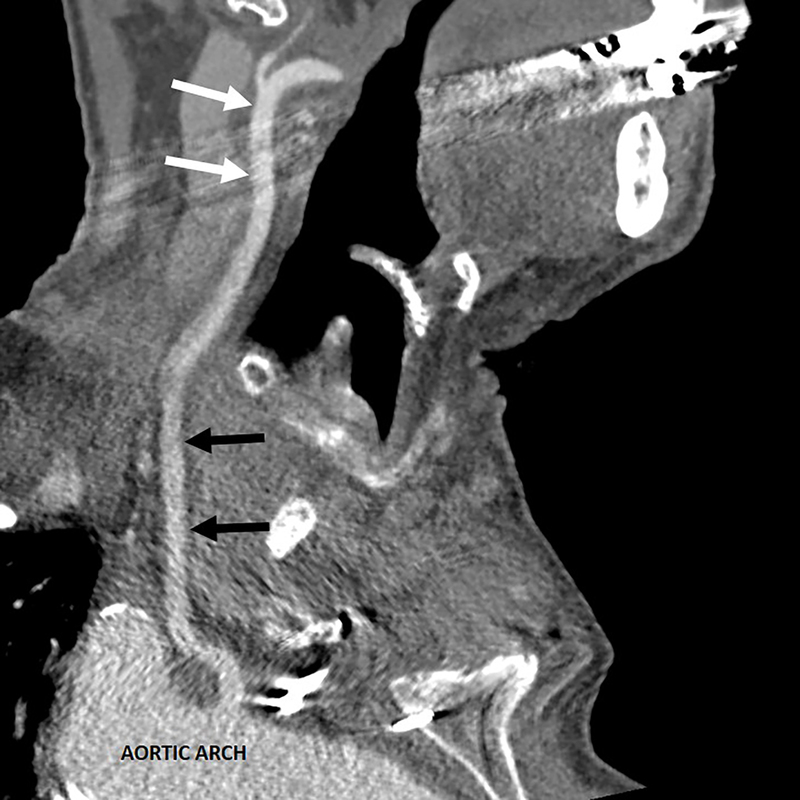 CT angiography of the neck demonstrates a normal course of the left common carotid artery, which terminates/continues as the external carotid artery; there is no bifurcation and no internal carotid artery (Figure 1). At the level of the skull base, the left internal carotid artery is absent (Figure 2A) and there is also absence of the left carotid canal (Figure 2B). 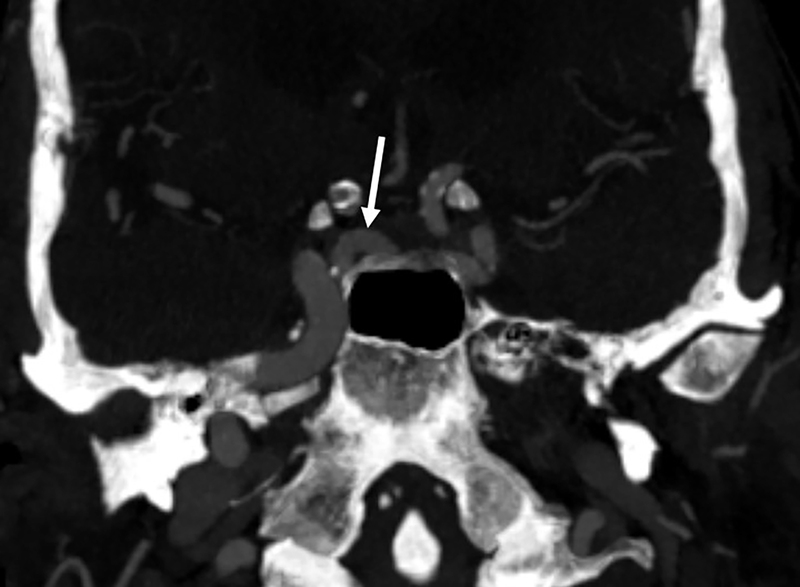 CT angiography of the head demonstrates a vessel branching from the cavernous segment of the right internal carotid artery, which crosses the cavernous sinus, and assumes the course of the intracranial left internal carotid artery terminus (Figure 3). Type A: Unilateral ICA agenesis; flow into the ipsilateral anterior cerebral artery (ACA) via the anterior communicating artery (AComm), and flow into the ipsilateral middle cerebral artery (MCA) via flow through the ipsilateral posterior communicating artery (PComm). Type B: Unilateral ICA agenesis; flow into the ipsilateral ACA and MCA via the AComm. Type C: Bilateral ICA agenesis; flow from the posterior circulation via the PComms or other patent carotid-vertebrobasilar anastomoses. Type D: Unilateral ICA agenesis; flow into the ipsilateral carotid siphon via an intracavernous anastomosis from the contralateral ICA. Type E: Bilateral ICA hypoplasia; flow into the MCAs via enlarged PComms. Type F: Bilateral proximal ICA agenesis; flow into the distal ICAs via the rete mirabile (transcranial anastomoses arising from the internal maxillary arteries). 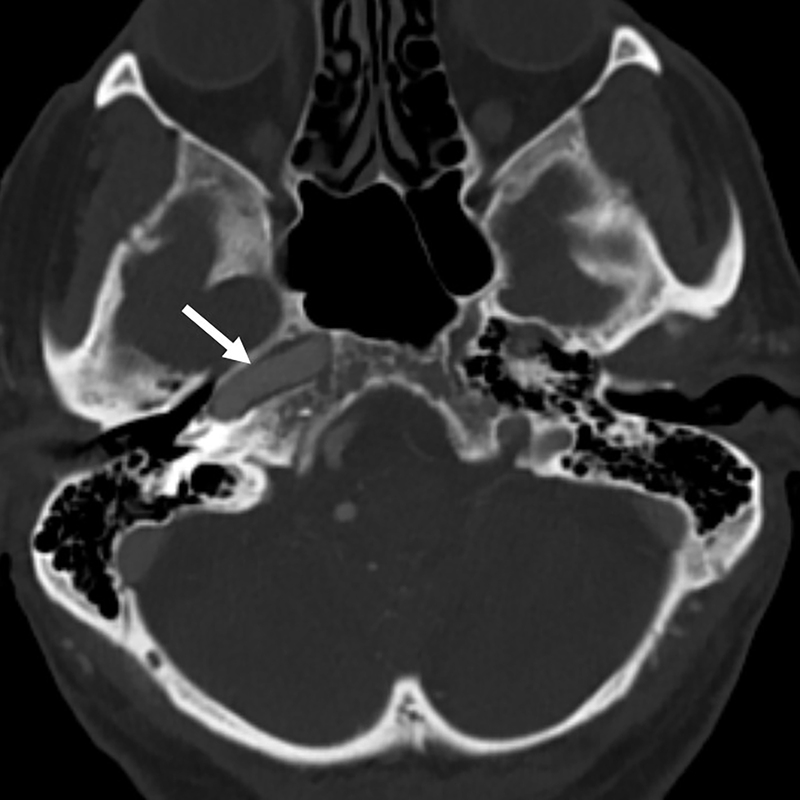 This case is an example of type D, in which the cervical, petrous, and cavernous segments of the ICA are absent, with the supraclinoid segment arising from an intracavernous vessel from the contralateral ICA. There are two theories regarding the origin of this anastomotic vessel. One is that there is an intracavernous connection between the two primitive trigeminal arteries, which do not connect to the posterior circulation. 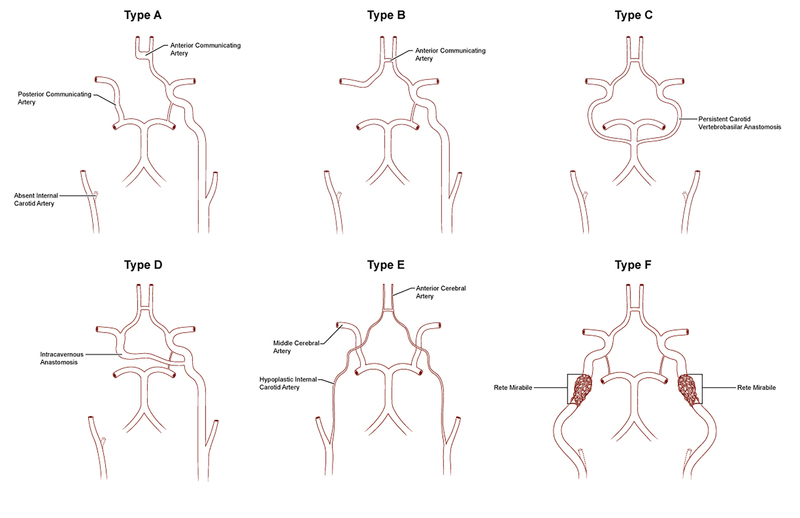 4 The other is that there is compensatory hypertrophy of a clival or sellar branch off the contralateral ICA, which eventually becomes the main blood supply for the intracranial ICA territory.5 In this case, as in other reports of intracavernous anastomosis,2,3,6-8 the intracavernous vessel continues as the middle cerebral artery (MCA), while the A1 segment of the anterior cerebral artery (ACA) ipsilateral to the absent ICA is aplastic or hypoplastic; this is slightly different than Lie’s original description in which the intracavernous anastomosis supplies both the MCA and ACA territories. Thus, the MCA territory is supplied by the intracavernous anastomosis, while the ACA territory is supplied via a patent anterior communicating artery. This is important because the relative isolation of the MCA territory leaves the cerebral hemisphere ipsilateral to the absent ICA susceptible to injury, due to lack of collateral flow from the circle of Willis. For example, in this case, occlusion of the right ICA could potentially cause infarct in the bilateral MCA territories. Congenital absence of the ICA in itself is a benign finding and often found incidentally;9 however, there is an increased incidence of concurrent intracranial aneurysm upwards of 34%,10 as compared to the 2-4% incidence in the general population. It is therefore important to look carefully for aneurysms; none were found in this case. Congenital absence of the internal carotid artery is a rare congenital anomaly. 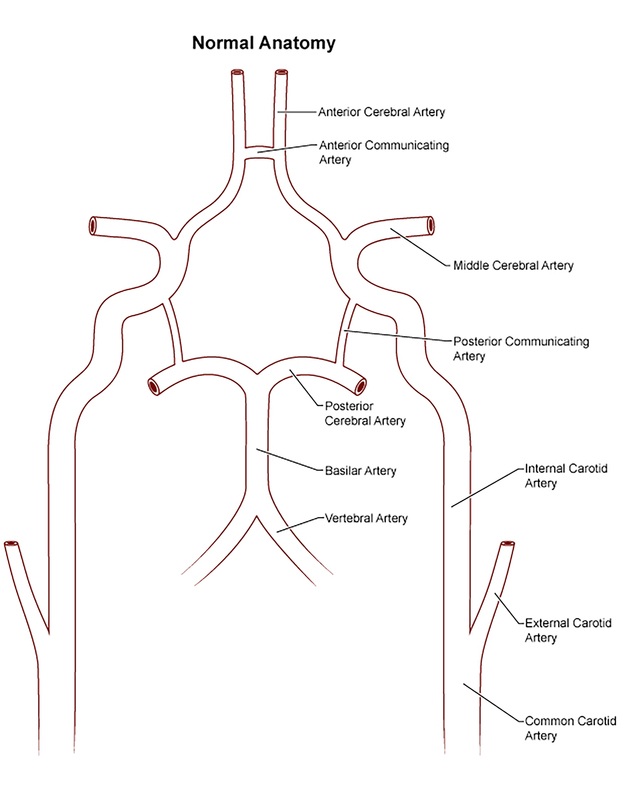 Collateral circulation to the ipsilateral cerebral hemisphere may be provided by flow through the circle of Willis, persistent fetal vessels, or collaterals from the external carotid artery. 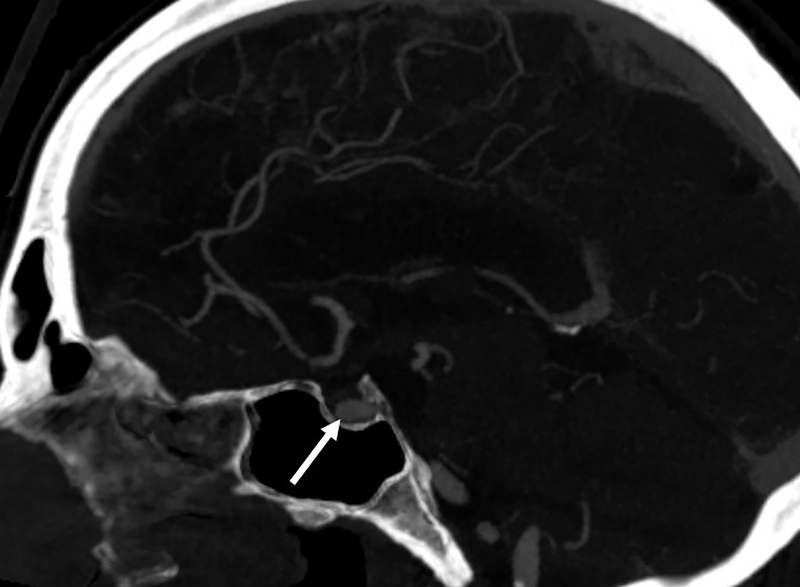 This case is an example of unilateral internal carotid agenesis with intracavernous anastomosis, with collateral flow from both the circle of Willis and from a persistent fetal vessel. This entity may be benign, but can have profound implications regarding collateral circulation to the ipsilateral cerebral hemisphere in the event of ischemia, as well as an increased incidence of intracranial aneurysms. Menshawi K, Mohr JP, Gutierrez J. A functional perspective on the embryology and anatomy of the cerebral blood supply. Journal of Stroke. 2015;17:144-158. Given CA, Huang-Hellinger F, Baker MD, et al. Congenital absence of the internal carotid artery: case reports and review of the collateral circulation. Am J Neuroradiol. 2001;22:1953-1959. Lee JH, Oh SW, Le SH, et al. Aplasia of the internal carotid artery. Acta Neurochir. 2003;145:117-125. Lie TA. Congenital anomalies of the carotid arteries. Amsterdam: Excerpta Medica, 1968:44-49. Kishore PRS, Kaufman AB, Melichar FA. Intrasellar carotid anastomosis simulating pituitary microadenoma. Radiology. 1979;132: 318-383. Smith RR, Kees CJ, Smith ID. 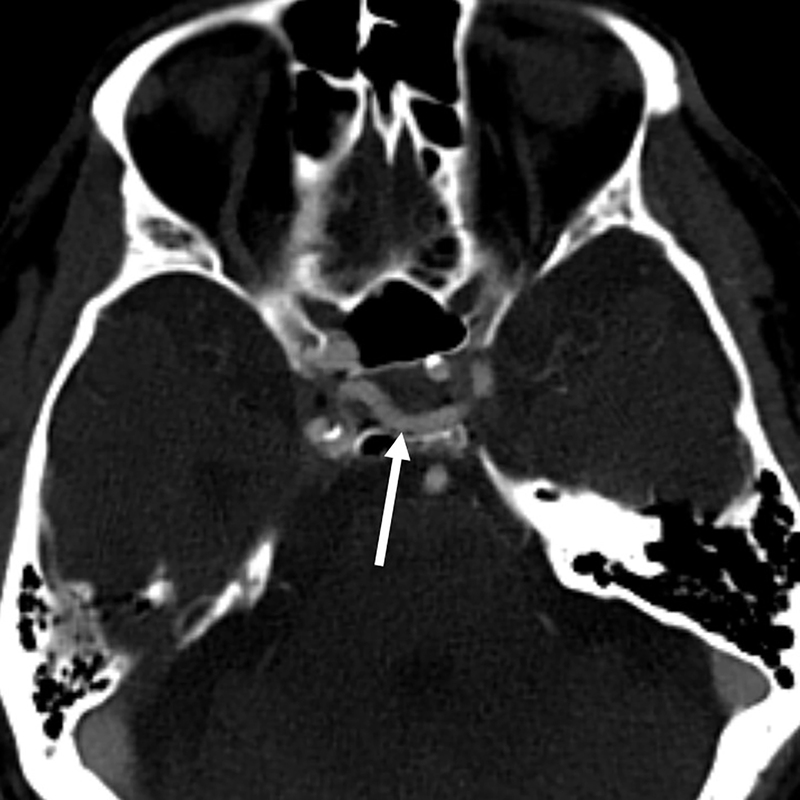 Agenesis of the internal carotid artery with an unusual primitive collateral. J Neurosurg. 1972;37:460-462. Elefante R, Fucci G, Granata F. Agenesis of the right internal carotid artery with an unusual transsellar intracavernous intercarotid anastomosis. Am J Neuroradiol. 1982;4:88-89. Quint DJ, Boulous RS, Spera TD. Congenital absence of the cervical and petrous internal carotid artery with intercavernous anastomosis. Am J Neuroradiol. 1989;10:435-439. Turnbull II. Agenesis of the internal carotid artery. Neurology. 1962;12:588-590. Shigemori M, Kojo N, Miyagi J, et al. 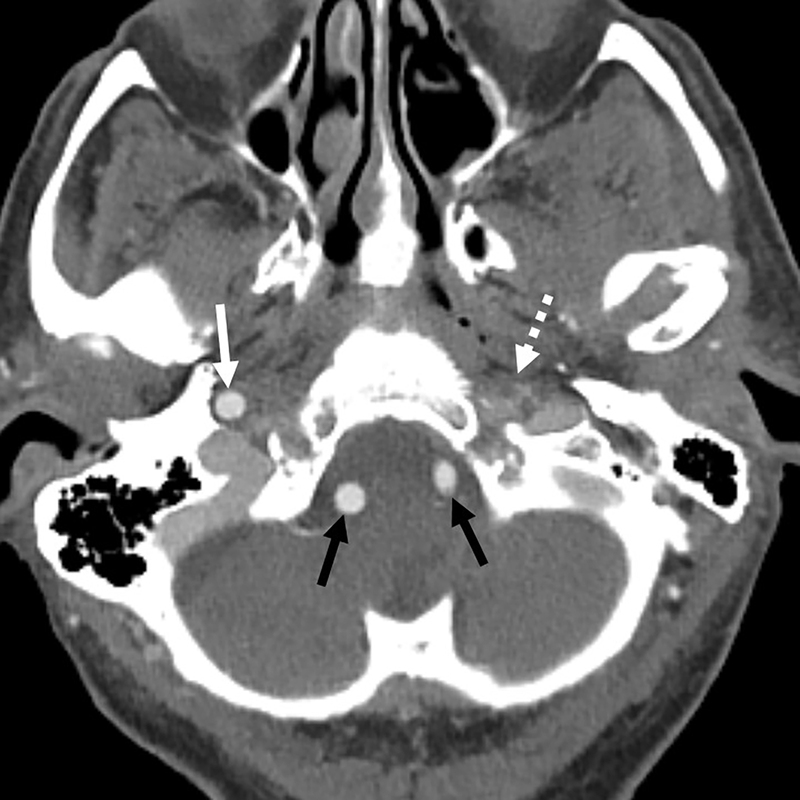 Agenesis of the left internal carotid artery associated with an aneurysm of the anterior communicating artery. Neurol Med Chir (Tokyo). 1980;20:73-79. Montoya S, Towner J, Bhatt . Unilateral agenesis of the internal carotid artery with intracavernous carotid-carotid anastomosis. Appl Radiol. 2017;46(10):19-22. Prepared by Dr. Montoya while in the Department of Imaging Sciences; Dr. Towner while in the Department of Neurosurgery; and Dr. Bhatt while in the Department of Imaging Sciences at the University of Rochester Medical Center, Rochester, NY.